These screw terminals feature a quality "elevator screw clamp" design instead of the cheaper "leaf spring" style. This provides for secure clamping of the wire and a long product life. 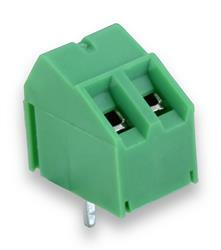 These terminal blocks are designed to snap together, allowing you to make a terminal strip as long as necessary. Winford Engineering uses these screw terminals extensively in our own product designs. Need a quality screwdriver for Winford STAx or STBx screw terminals? Winford sells Wiha screwdrivers, which are a perfect fit!